In my last post I discussed some general impressions of the 2016 CES (Consumer Electronics Show) and I promised more about the many, many drones that were on display. Obviously drones are becoming a bigger and bigger part of video production and any videographer or production house needs to at least be aware of what drones can and cannot do for them. Unfortunately, we are going to have to make some major breakthroughs in the area of noise cancellation before any of these drones will be able to gather audio with one of our parabolic microphones. But it’s still fun looking! This was the most interesting and by far the most expensive “drone” at the show. It is the Ehang 184 “drone” that was on display. It is intended to carry a passenger, like a package, to a pre-programmed location. Because the passenger is merely a passenger and not “operating” the machine it can evidently be classified as a “drone” instead of a helicopter. I’m not sure I’m quite ready to strap myself in one of these things. Click here for more info. This photo shows the least expensive version, I saw, of what would normally be considered a drone (quadcopter). It will not be available for a few months but its selling price is only $500. For that price you only get 720 video but it’s an interesting option. It includes a watch band type of device that lets the drone follow you or orbit around you. That’s pretty impressive for the price. If you look closely you will see that the drone has a its own cage that supposedly keeps it from running into, and damaging objects (including humans). The cage is also designed to upright the drone if it should crash so that it can take off again with the application of power. Click here for more info. I am still not quite sure if this paper airplane would be considered to be a “drone” by many people but it can provide remote video from a airborne craft so I think it qualifies. This product would then take over as the least expensive “drone” that I saw at CES at a price of just $200. While it cannot hover like a quadcopter, it can provide remote airborne video controlled by your smartphone. It may be worth checking it out. Click here for more info. I can’t neglect to mention the new drone that Yuneec will be releasing soon. 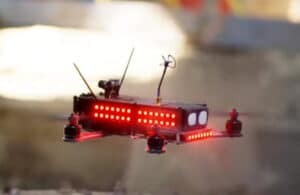 It was developed in cooperation with Intel (which bought a portion of Yuneec) and incorporates both thermal and ultrasonic sensors to avoid collisions. The drone would actually move away from the operator as he walked toward it. When instructed to fly into a post, the drone simply diverted around the post and continues on its path. The projected price is $2000 but it was very impressive technology. Click here for more info. Below are the photos I took to show the wide variety of drones and I’m sure I missed some smaller manufacturers that didn’t make into the big hall. I did not stop and look at each drone but you can see how prolific and diverse the drones have become. Is it just me, or do some of these drones look like they were designed by George Lucas?